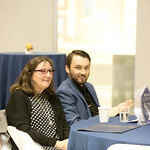 The College of Education and Human Services and the Department of Alumni Relations honored Christine Baker, Ph.D. '90, and the late Gerard Babo, Ed.D. 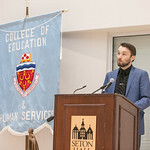 '01, associate professor in the Department of Education Leadership, Management and Policy at the annual Spring Alumni Reception & Awards ceremony on March 27. 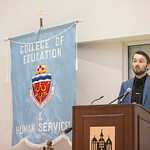 This year's ceremony had particular significance for the College. Associate Professor Gerard Babo, the honoree for the Schreitmueller Faculty Servant Leader Award, had only recently passed away, but not before learning that his award would be received by members of his family. In Monsignor Christopher Hynes opening invocation he remarked that, "Today, the world is in need of role models like the two honorees this evening. Gerry Babo exemplified the meaning of the Schreitmueller Award's essence of true servant leadership. There could be no more appropriate recipient of such an award at this particular time and place." Dean Maureen Gillette continued with a heartfelt and emotional tribute stating that, "He [Gerry] wanted to be here tonight. He is here with us in the hearts of everyone he affected through mentorship, friendship, and simply by his commitment to caring about making the people around him better." She continued, "He made statistics fun for even the math phobic and his engaging Youtube videos are still available to anyone who wishes to benefit from his unique ability to have you 'get it'. In typical fashion for Gerry, he even wrote his own bio tonight." 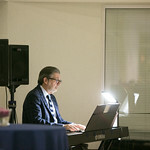 The dean then provided Babo's humble version of a biography that acknowledged accomplishments and expressed his passion in pursuit of making great music, yet avoided being self-congratulatory, instead giving thanks and credit to the countless students and colleagues he had the privilege of instructing and learning from himself in the arts and education. "They [students] were the most important to him. On Facebook pages, blogs and emails, countless students wrote about how they would not have gotten through the statistics portion of their doctoral programs without him. 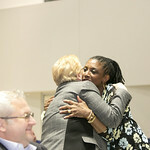 In all, he mentored over 300 doctoral students," stated Dean Gillette. In his acceptance speech on behalf of his father, Zachary Babo also referenced the many alumni who attended the memorial service in thanks and respect to a most revered professor. "Our cup runneth over with the overwhelming outpouring of support from the Seton Hall community who shared their gratitude for their success through my father. Much like my own relationship with him, he always had time to help work out a problem, guide a dissertation – and in the process, have you find out more about yourself. He never gave up on me and all of his students. Does anyone embody service of this award like a teacher? Please use my father's legacy to carry his passion and work forward. It's up to all of us to grow in his light." 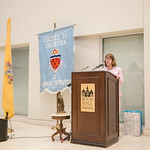 Christine Baker, Ph.D. '90, recipient of the 2019 Hanbury Alumni Mission Award, quickly and successfully brought an air of mirth to the proceedings, beginning her acceptance speech by proclaiming, "To be home… I am honored and humbled. Hanbury's mission was to help those in need. Thank you Seton Hall for keeping this alive. I was attracted to the school for this reason. It had a program for school AND community psychology! Imagine that! My thesis project involved educating and counseling young women in the urban areas of Jersey City on contraception and depression. Yes, I said it and I did it at a Catholic institution!" 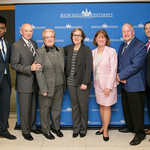 Baker then emphasized how important and unique such a program and the ability to pursue it academically meant to her as well as the community, and spoke to the integrity of the mission of Seton Hall. "A professor here told me to 'take the grain, leave the chafe.' I employ this statement wherever I go to this day," she stated. 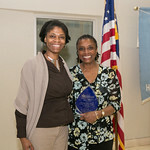 In accepting her award, Baker ended with, "I wholeheartedly accept this award as a challenge to continue. I'm ready, and I hope you are too." Christine Baker, Ph.D., is Clinical Director of the Metro Regional Diagnostic and Treatment Center at Newark Beth Israel Medical Center, one of four legislatively mandated child maltreatment centers in NJ. Dr. Baker directed the Community Based Adolescent Medicine rotation at RUTGERS-NJ Medical School Newark Campus, as Clinical Assistant Professor of Pediatrics for more than 15 years. She served as Visiting Specialist at Montclair State University's Center for Child Advocacy, and has been qualified as an expert witness in child maltreatment for civil and criminal cases in several NJ counties. Dr. Baker is former President of the NJ Chapter, American Professional Society on the Abuse of Children (APSAC-NJ), and was recognized with the "President's Honor Roll" award by national APSAC in 2003. She has published in peer-reviewed journals, and has presented at local, state, and national conferences. Dr. Baker is also the author of Cherry Blossom Land at Branch Brook Park: A Bamberger Fuld Legacy. Dr. Baker has been honored with the Healthcare Foundation of NJ's "Lester Z. Lieberman Humanism in Healthcare Award", and the "Live Your Dream Ruby Award" by Soroptimist International of Suburban Essex. She currently serves on the Prevention Sub-Committee of the NJ Task Force on Child Abuse and Neglect where she helped develop the most recent "Standards for Prevention Programs". Dr. Baker is the current Chair of the Board of Trustees at Integrity House, Inc. and Chair of the Quality and Safety Committee. She is a founding member of Sisters Enlisted to Empower Dreams (SEED, Inc.) where she serves as VP and Treasurer. Gerard Babo, Ed.D., spent over 30 years in public education as an Instrumental Music Teacher, Supervisor of Art and Music, Director of Special Education, Assistant Middle School Principal, Elementary/Middle School Principal and as an Assistant Superintendent of Schools. He received his B.A. in Music Education from Fairleigh Dickinson University, an M.A. 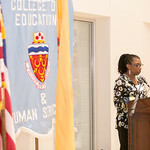 in Music Education and Educational Administration from New Jersey City University and an Ed.D. in Educational Leadership from Seton Hall University. 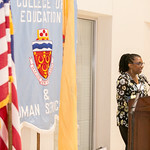 Before coming to Seton Hall University in 2010, Dr. Babo was an assistant professor and chairperson for the Department of Educational Leadership at Kean University in Union, NJ. 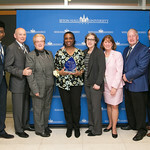 While at Kean, he also served as the Interim Dean of the Nathan Weiss Graduate College. 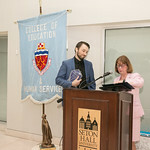 His last position was as an associate professor with the Department of Education Leadership, Management and Policy at Seton Hall University where he taught courses in statistics, research design, supervision and evaluation of instruction and educational policy. Since moving to higher education, Dr. Babo founded and served as co-president of the New Jersey Affiliate for the National Council of Professors of Educational Administration and served as Editor for the International Journal of Educational Leadership Preparation, a leading international, peer-reviewed journal in the field. He authored or co-authored twenty-four peer-reviewed articles in some of the leading journals in the field of school administrator preparation focusing on principal preparation and evaluation. A number of these publications were co-authored with Seton Hall graduate students. Additionally, his interest in data driven decision to inform practice and/or policy led to his co-authoring a book in 2015 with former Kean University colleague Dr. Len Elovitz entitled, Quantitative Data Analysis Using Microsoft® Excel: A School Administrator's Guide, which was published by NCPEA Press. When not teaching, advising and mentoring students or pursuing his research interests, Dr. Babo freelanced as a professional acoustic and electric bassist in the New York/New Jersey/Pennsylvania metropolitan area.